A new stop on the way to the Triple Crown? 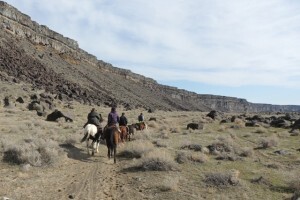 February marks the beginning of trail riding season for many of us in the Squaw Butte Chapter. We are fortunate to live in a part of the country where diverse terrain and climate allow for adequate riding weather year round. 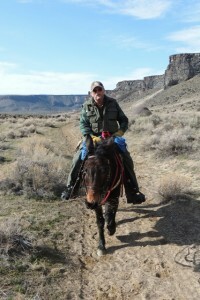 Deep snow and cold may linger in mountains surrounding arid high deserts of sand and sage suitable for horse and rider. Celebration Park was again the chosen site for this year’s first of the season fun ride. It is easy to understand why ancient civilizations made this area their home for thousands of years. A natural fortress of rock cliffs borders an edge of the Park with the Snake River flowing with life through the center, spanned by the Guffey railroad bridge, built in 1897, marking one of few Snake River crossings. 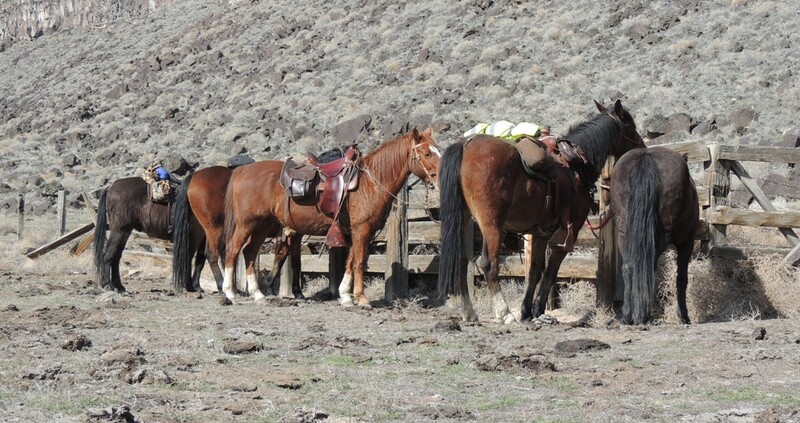 Six SBBCHI members saddled ready to ride by 11:00AM on a beautiful February morning – beautiful despite being a Monday! The ride was originally planned for the previous Saturday but Mother Nature had plans of her own – plans of driving wind and rain not conducive to trail riding. Our group meandered through the desert floor littered with large boulders adorned with petroglyphs dating back thousands of years. We skirted Halverson Lake, crossed a marsh fed by a small spring and tethered to the remains of an old corral for lunch. The dilapidated corral is in dire need of repair. Loose barbed wire, rotted rails and a few sound posts are all that remain. We talked about fixing the corral up last year. Unfortunately, the corrals are not part of the park. They are owned by a California rancher and nobody seems to know how to get hold of him. It is not easy for a group of folks who seem to have the “fix it” gene imbedded in their DNA to see such a thing go unattended. I would not be surprised to find the corral in better repair come next year’s fun ride. We looped around back toward the trailers along a trail hugging the Snake River. Janine and little Hilary had left before lunch so Janine could return in time for work. Rob and Teri rode on ahead while Bill and I took up the rear, chatting about the best way to cook rattle snake and rock chuck. Bill rode Billy Bob, a large, loveable mule whose personality is reminiscent of Eeyore. I asked Bill if he thought Billy Bob could run. Bill replied he thought so. He has seen Billy Bob run in the pasture and he sure looked pretty. I don’t think my mule, Annie, can run very fast, I commented. She runs real stiff legged. Ruth, the mule Festus rode in Gunsmoke – was the only mule I’d seen that could outrun a horse. An observation that was about to change. Thankfully, Bill was not seriously hurt although I imagine the next couple of days would find Bill discovering soreness in places he didn’t know he had. I pulled away from Celebration Park with a conviction of working on König’s brakes in the days to come and one more reason for the heartfelt prayers that Jack would heal quickly. Back home I came across a documentary on the great Triple Crown winner Seattle Slew. Slew was purchased for the unbelievably low price of $16,000.00. 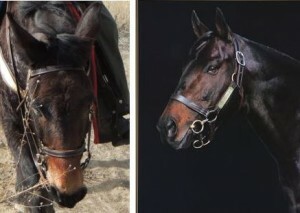 It was said by some that he was not a pretty horse in the sense of what a race horse was supposed to look like. Some said he looked more like a mule than a horse. I pulled up a picture of Seattle Slew and placed it alongside one of Billy Bob….damn if there wasn’t an uncanny resemblance. I know where I’d place my $2.00 bet. What an opportunity to raise money for the chapter, racing Billy Bob! Not sure Bill wants to be the jockey though.